The pattern is made with seaweed. 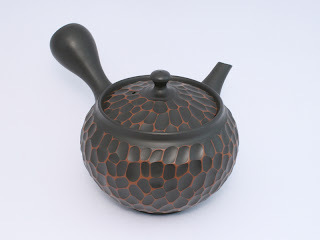 Seaweed is fired on the tea pot, and the pattern is created. It is a natural pattern and never the same twice. 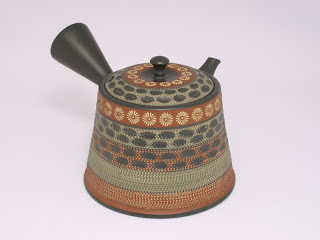 To get this beautiful pattern the pot is turned on a wheel. The potter uses a sharp tool to make tiny indentations. The potter stamps flowers and cuts on the surface to create a beautiful design. 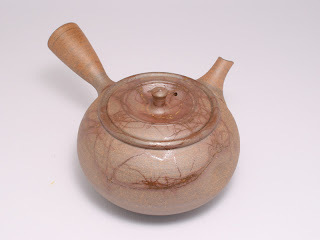 Tokoname is famous for red colored clay. When the clay is fired, it turns black. The potter then uses a file to expose the red clay underneath. 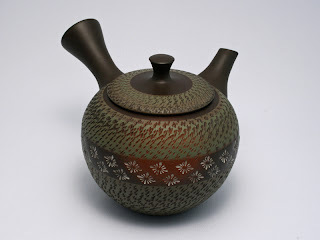 The pot consist green, red and beige color of clay. 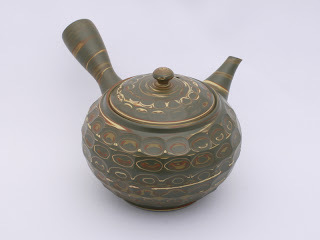 Those were mix and then formed as tea pot. The surface was cut like diamond, shows unique color. Whole processes were done by master potter. I visited your web server for the first time but once found it all that I details please and that I have long sought. Of visits to your server one pleasure (all under "" at hand "")!